I don’t think that I have ever been happy with my weight. I wasn’t fat in college, but I wasn’t skinny either, probably just a little heavier than average wearing a size 12. I really started gaining weight after I graduated with my undergraduate degree from the University of Kansas. I went from walking everywhere – to work, to class, etc. – to sitting at a desk in front of a computer all day. My evenings were spent in front of the TV or with my nose in a book. I gained around 30 pounds. The pounds really started coming on after I was diagnosed with and starting taking medications for depression. I had to be hospitalized and within a year after my hospitalization I weighed nearly 250 pounds. 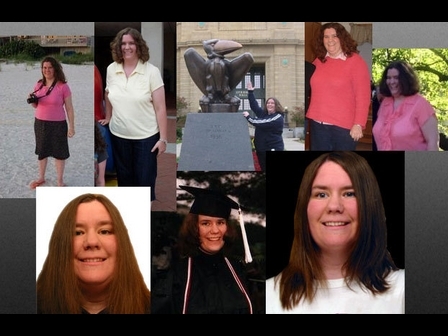 That was 2004 and the comparison between my undergrad graduation photos and graduate school graduation photos is scary! It took another four years before I got serious about losing weight. It was kind of a New Year’s resolution of mine sparked by the fact that I didn’t weigh as much as I thought I would after the holidays. I meet with a trainer; and when I was weighed, I was guessing that my weight would be 260 pounds. I ended up weighing in at 245. I was wearing a size 22. In 2008, I lost almost 60 pounds on my own getting down to around 190 pounds. I got stuck in a plateau at the end of the year and finally started losing again after joining SparkPeople.com in January of 2009. Since joining SparkPeople I have lost about 25 pounds and am about 20 pounds from my 100 pound goal. 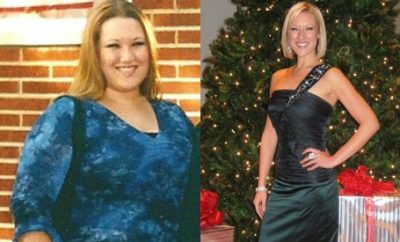 To lose weight, I have not used a magic pill or surgery. I have just been eating right and exercising. I have recently started blogging at https://losingitmyweigh.wordpress.com/. I call it a wellness blog which I use to chronicle the health related struggles that I go through on a daily basis. When I am not exercising, trying to eat right or keep my mood stable; I work in the field of educational technology, which is the area my master’s degree is in. I am employed by and go to school at a major Midwestern university. If I have any spare time left, I like to read, go for walks with my dog, garden, and take photographs. I am a pretty shy and reserved person.